Multiple Sclerosis appears on most cannabis “Qualifying Conditions” lists in the United States and has been featured in some research in recent years. As such, cannabis is now widely regarded as an acceptable treatment for this auto-immune disease, for which there is currently no cure. While cannabis has been shown to address both nociceptive and neuropathic pain, it appears to have the best effect on the latter, which is the primary type of pain afflicting people with MS. But the ability of cannabinoids like THC and CBD to interrupt the pain signals sent through the nervous system is not the only way cannabis helps MS patients lead more normal lives. MS causes inflammation in the brain, which results in the damage and death of neurons, and increasingly severe symptoms. Superstars THC and CBD (and likely a whole host of other cannabinoids yet to be closely examined) have strong anti-inflammatory powers that can prevent the body’s immune system from over-reacting and attacking the central nervous system. There is also some evidence that cannabis can help the body regenerate the neurons that have already been destroyed. Thanks to these immune system issues and muscle spasms, gastrointestinal issues are common among people suffering from MS. Cannabis has the same effect on inflammation in the stomach as it does in the brain, calming GI distress and stimulating digestion. Plus, as we all know, cannabis promotes appetite! Perhaps the best-known benefit of cannabis for multiple sclerosis is its ability to ease stiffness and spasms of the muscles, a debilitating symptom that affects about 1/5th of patients. Animal tests with CBD gave mice with severely stiff joints the ability to walk again, and small human studies have had similar results. Unsurprisingly, this host of symptoms makes it extremely difficult for many people with MS to get a good night’s sleep. When consumed as an edible an hour or so before bed, relaxing cannabis strains can help individuals fall and stay asleep, unencumbered by the symptoms that would normally disturb them throughout the night. A decent sleep is vital to a successful battle with any illness. 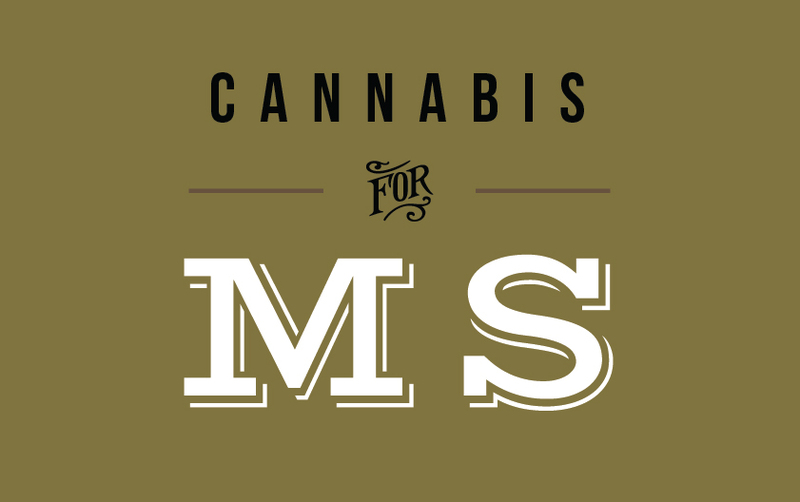 As if all these incredible benefits were not enough, cannabis can also help individuals get through the secondary symptoms and conditions that can arise from their struggle with MS. Specific strains can tackle depression, and address the blurry vision that often develops thanks to inflammation. Despite the amazing promise cannabis holds for MS, the scientific studies are still few and far between, and those that exist are often dismissed due to the small sample size. But it is easy to find anecdotal evidence from MS sufferers who have tried cannabis and seen incredible results. One study examined patients already treating their symptoms with cannabis. The majority of the subjects reported fewer neurological difficulties than those not using this natural treatment, and many were even able to cut back on or completely eliminate their prescription medications, relying almost entirely on cannabis. These patients often offer details of their treatment regime, which may include baked goods with indica cannabis strains before bed and vaporized flower or concentrates during the day, to treat everything from pain to muscle spasms, to mood. While every case is different, some patients with MS describe a notable lack of symptoms after using cannabis, and even regression of the disease. At FARM, we offer hundreds of cannabis products, many of which can address multiple symptoms at once. Medi Bloom: Charlotte’s Web tincture can improve mood, aid sleep, and ease muscle spasms, while cannabinoid capsules (which come in a range of THC and CBD potencies) conquer inflammation and pain. Stop by to speak with one of our knowledgeable FARM staff members who can answer any questions about cannabis strains for multiple sclerosis, or any other condition you hope to treat.